Our team uses industry leading equipment combined with environmentally friendly cleaning solutions to ensure every task is completed properly, quickly, and safely. Our premium cleaning products are the best in the industry and can remove stubborn stains and mildew. We have been providing top quality service to both commercial and residential properties in Shady Side Md 20764 and the surrounding areas including Deale Md 20733 for over 15 years. You can be confident that you’ve made the right choice in professionals to keep your investment clean and safe. Call your local power washing pro’s today for a free estimate. We will keep your property looking its best all year round! 100% Customer Satisfaction Guaranteed! We believe that we can achieve our goal by providing top quality & reliable service, by giving honest but competitive prices in Shady Side Md and by striving for excellence. We promise to not only meet your expectations but also to exceed them. Our goal is to keep you happy because we believe that a happy and satisfied customer is a customer for life. Annapolis Brothers Power Washing is setting a new standard for the professional pressure washing industry. Pressure washing can cut cleaning time in half, giving you more free time. More effective in removing grease & oil in concrete. Saves money over renovating or replacing surfaces around your property. We will remove sticky residue like gum and stubborn mildew stains, something that the typical garden hose cannot remove. High-pressure washing helps maintain the resale value of your property. It helps sanitize your surroundings keeping your family and customers in good health. A well maintained property conveys a lot about you. Adds instant curb appeal to your property. 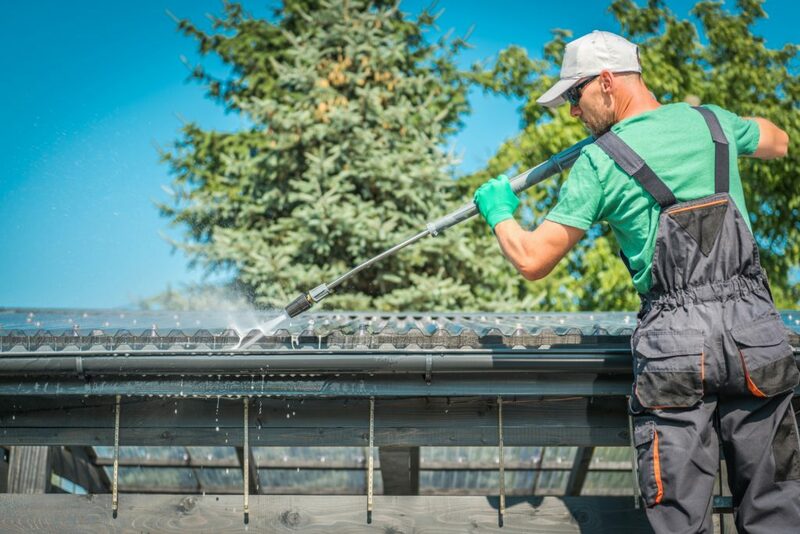 Soft washing is simply, a gentle exterior cleaning method to remove and destroy algae, mold, mildew, bacteria and moss from exterior surfaces and roofs. Soft wash works immediately on contact and can be used all year on a wide variety of exterior surfaces. Our soft washing cleaning agents are designed to work on a variety of materials around your property, safely and effectively. After the solution has been applied, it will penetrate into the surface, travel down through the roots, and kill the entire organism or fungi upon contact. After allowing the detergent to dwell for a designated amount of time we will then follow through with a thorough rinse, keeping all surfaces around your home in pristine condition. You will be amazed at the results that can be achieved, so why not join your neighbors in Deale and Shady Side Md, and try out our soft washing services today! Our exterior washing services in Deale Md are a safe, easy, and cost effective way to keep the surfaces of your property clean and well maintained. Keeping the dirt, grime, and mold off of your home or commercial building will greatly enhance the longevity of the property and will delay the need to replace surfaces such as siding, deck boards, roofing shingles etc. You can, of course, try to wash your home or business in Shady Side Md on your own but without proper education and training there is a high risk of doing irreversible damage. Since your property is undoubtedly your largest investment, put it in the hands of an experienced pressure washer. The exterior of your commercial property can have long lasting first impressions that will either attract or deter clients. For potential customers, a dirty storefront can communicate neglect to your business in Deale Md and a lack of professionalism. With a combination of our power washing techniques and window cleaning services, we will remove most unsightly surface grime, mold, foul odors, and years of build-up. In addition, power washing and soft washing services can remove the majority of oily deposits and pollutants reducing the risk of liability and preserve the safety of customers and employees. Property maintenance can often feel like a huge task and the to-do list around your home can feel unending. Thinking about maintaining driveways, walkways, siding and rain gutters all accumulate tough build-up, stains, cobwebs, and grime over time. When left unkept your home’s exterior can develop mold, mildew, dirt, and many other contaminants to become fixed to your home’s exterior. This can have a negative effect on your home’s curb appeal but, more importantly, cause irreversible damage to your home’s exterior, and consequently take away value from your property, and cause costly repairs. With our exterior washing services in Shady Side Md, we are ready to help you get your home looking like new again! We automatically put our customers on our regular cleaning maintenance schedule and will remind you when it is time for us to come spruce up your home again. Here at Annapolis Brothers Power Washing, we are here for our neighbors in Shady Side and Deale Md to provide 5 star exterior washing services at every single job we do. We have taken the time to perfect our cleaning solutions and techniques because we want to serve our clients better. We provide accurate quotes, and on-time service with a friendly and courteous staff. Each member of our team are professionally trained and certified. Fully insured and prepared to take on all jobs, big or small. Let Annapolis Brothers Power Washing come take care of your pressure washing needs in Maryland today! Affordable pricing and high quality work! Thanks for cleaning the dirty streaks off of our roof!! It looks brand new!!! Will definitely be calling to have more pressure cleaning done to my home. I called for a free estimate, and they came the next day. I accepted and they got me scheduled fast! The soft washing service is amazing, gentle for my homes exterior and roof. They were very helpful and highly knowledgable. High quality services, the price is fair and the pressure cleaning services are awesome. They removed stubborn stains from my concrete quickly! 5 Stars! Wonderful team of workers, they were very polite and answered any questions that i had about the process and protecting my plants. They did an incredible job making my home look clean. Team was punctual and got right to work and did a great job. I highly recommend Annapolis brothers power washing. We are blown away with how great our home looks after annapolis brothers power washing came to soft wash our siding and roof. 5 star service, professional, and great communication! This company does amazing work! They are the best power washers in town, hands down. Their services are affordable, and each worker is highly qualified and professional.